Follow these hardgainer workout tips to jack up your training and build more muscle. If you are a hardgainer that is frustrated by your fast metabolism and slow gains, getting big may seem difficult, but it’s not impossible! You need to follow your own set of hardgainer workout rules. Reduce isolation exercises, instead focusing more on training with compound exercises. Compound movements are those that involve several muscle groups and more than one joint and are the biggest muscle builders. Examples are Squats, Deadlifts, Overhead Press, Bench Presses, Bent over rows, Dips and Chin-ups. Compound exercises allow you to lift heavier loads and increase strength. Lift big, lift heavy. The primary focus of your hardgainer workout needs to be on lifting heavy and therefore keeping your rep range low (6-10reps). Progressively overloading your muscles is the key to gaining muscle mass and training using a variety of different techniques and percentage of rep-maximums will help you build muscle mass. As a rule, to grow muscle mass, you need to firstly build muscle strength. This is why many bodybuilders take a power lifters approach of lifting very heavy weights with low reps to gain muscle mass. Since you’re lifting heavy make sure you also extend your rest periods to regain maximum strength. Ditch the exercise machines in favour of free weights. Free weights will improve your strength and balance, more so than exercise machines. Exercise machines can often be inefficient as they target only one or two muscle groups at a time, while free weights tend to utilize several muscle groups in one move, making them more effective for muscle growth in your hardgainer workout. When done correctly, there is a place for some cardio in your hardgainer workout program but too much cardio can be counterproductive to your muscle gains. This is because to build bigger muscle your calorie intake must be greater than the energy you use, and often regular cardio sessions will burn through your calories too quickly and limit your muscle gains. Particularly if you are hardgainer and have trouble building muscle size, it is best to focus on heavy resistance and eating big when you want to gain muscle fast. Spend your time in the gym lifting heavy rather than running on the treadmill. If you are looking for the fat loss benefits associated with cardio we recommend high-intensity sprinting that leads to greater fat loss than low-intensity cardio and in some studies has been shown to maintain and possibly increase building muscle mass. Mix up your hardgainer workout training program. Do not always train using the same exercises, there are so many different variations and movements so get creative, and change your routine. Vary your sets and reps, alternate your grip, and try working different muscle groups together. Variety is important for muscle growth. If you have been doing the same exercise, sets and reps as part of your hardgainer workout for longer than 8 weeks, its time for a change. Post-workout is another essential time for hardgainers to feed your muscles. In order to get big and increase muscle bulk hardgainers should consume a meal or protein shake within 30minutes of training consisting of carbohydrates and protein. 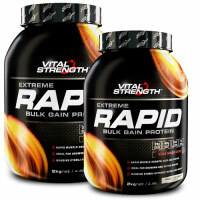 Vitalstrength Extreme Rapid Protein is an ideal post workout shake for a hardgainer. To ensure your size gains are maintained and your efforts in the gym are never wasted, Vitalstrength Rapid also contains key micronutrients for muscle growth and repair. Finally, commitment and consistency are critical to bringing about the kind of weight gain you want. As a hardgainer it is even more important for you to make a commitment to eating big and training effectively. Plan out your food intake and hardgainer workouts, changing them up every 6-8 weeks. It is no secret, getting big takes patience, consistency and hard work! Previous articleSUPERFOODS FOR YOUR MUSCLE BUILDING DIET: WHAT IS KALE?